These flexagons are made from kites, quadrilaterals where adjacent pairs of sides are equal. Click on the following two thumbnails to get the full sized versions. Print them, cut them out and paste them back to back. Cut along all the solid black lines and pre-crease along the dotted gray lines. Start by folding adjacent 5's together. Continue by folding together adjacent 4's and 3's. Repeat this process three times so only the 1's and 2's are visible. Finish by taping together the adjacent edges of the first and last squares in the template. 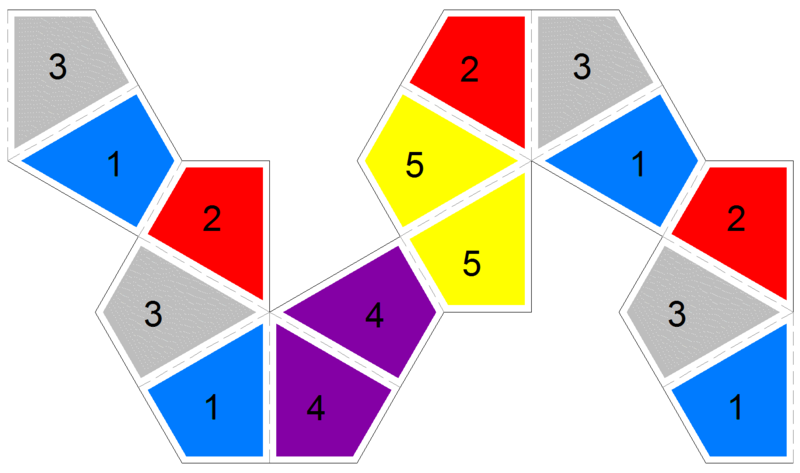 The video shows the pinch flex, pyramid shuffle, silver tetra flex, tuck flex and flip flex The following sequence shows performing a flip flex on a kite hexaflexagon. The kite I've chosen to use here has a 60 degree angle, 120 degree angle and two right angles. This means that the flexagon lies flat if there are 6 leaves (a hexaflexagon) and the central angle is 60 degrees. If any of the other three angles are in the center, the result is greater than 360 degrees so it doesn't lie flat. But if there are only 4 leaves (a tetraflexagon), then it lies flat if either of the right angles is in the center. If the 60 degree angle is in the center, it's a cup that you can't flex through. If the 120 degree angle is in the center, you end up with sort of a flower that can "snap" into a second position that may allow additional flexes. 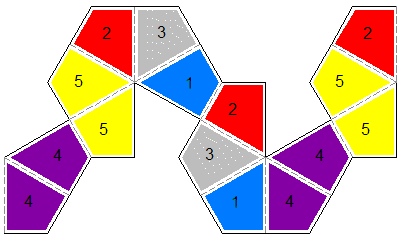 The kite tetraflexagon has four faces per side. 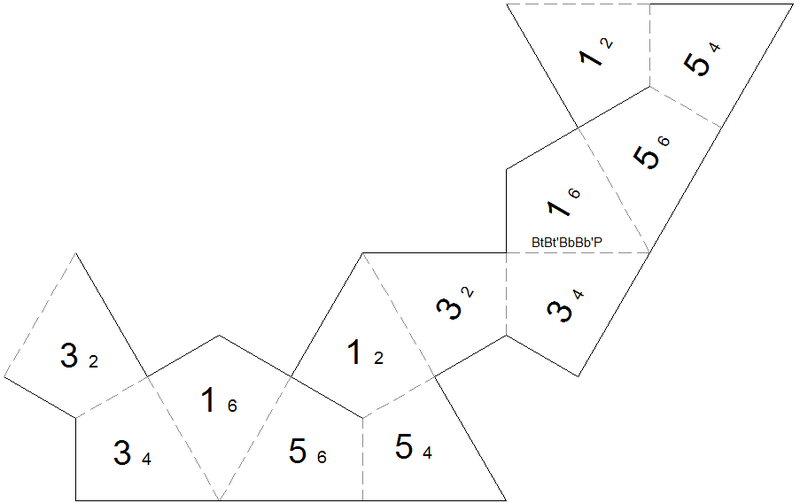 It flexes a lot like the square tetraflexagon, with pinch flexes and box flexes, except that sometimes a side isn't flat, similar to triangle tetraflexagons. Click on the thumbnail to get the full sized version. Print it and cut along the solid black lines. Pre-crease along the dotted gray lines. On each kite, copy the small number onto the back of the kite. Start by folding together the adjacent pairs of 6's. Continue by folding together other pairs of adjacent numbers in descending order. Repeat this process until only the 1's and 2's are visible. 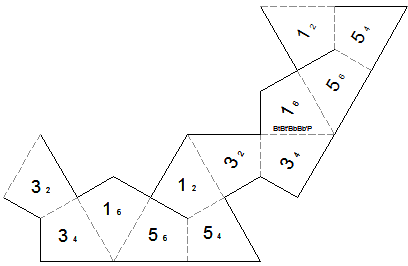 Finish by taping together the adjacent edges of the first and last kites in the template. From the initial position of 1/2, you can pinch flex from side 1 to side 3, or box flex to side 5 or 6.